Eve (along with her husband, Adam), is a well-known biblical figure. I’m surprised she’s only mentioned by name four times in the Bible, twice in Genesis and twice in the New Testament. I’ve never understood why Eve bears the heaviest criticism for disobeying God. Adam is likewise culpable, and he could have—and should have—put a stop to eating the forbidden fruit. More contemptible is the serpent, who resorted to lies to trip up Eve. Because of their actions, all three—Adam, Eve, and the serpent—suffer consequences, which they will pass on to future generations. So before Adam and his wife messed up, things must have been the opposite: childbirth was easy, women did not seek to control their husbands, and men did not rule over their wives. Going forward, women would desire to control their husbands, and husbands would rule their wives. 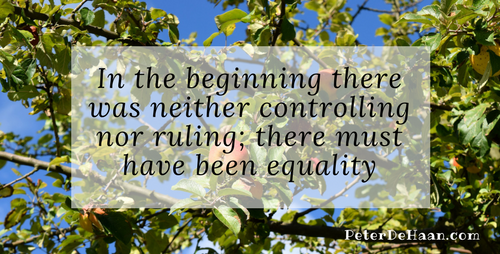 However, in the beginning there was neither controlling nor ruling; there must have been equality, with God intending spouses to live as equals.